With the right gear, leading an active, mobile lifestyle is more than possible - it’s fun. As a freelance writer/photographer specializing in travel, every trip is a blend of work and play. So, when an assignment took me to South West England for a walking tour, I needed more than a backpack. I wanted a multipurpose bag that could double as a carryon laptop and camera bag en route to England, and lightweight trail pack once I’d landed. Waterproof. This was England afterall and in a sudden downpour I needed to know that my camera equipment would be protected. On the trail, the neon yellow built-in raincover performed beautifully, keeping contents dry while assuring I was highly visible in even the most inclement weather. TSA-sized. For air travel, I wanted a pack that fit easily into the overhead compartment and had ample space for travel necessities, laptop computer, and camera equipment. Once there, it needed to transition easily to the needs of the walk’s daily activities. The momentum’s dedicated laptop sleeve, padded top and side travel handles, stowable harness and hipbelt, and top-load access made it a perfect choice. Quality designed. I see no reason to compromise quality or comfort for travel convenience. So, when I read that Osprey built their travel backpacks with the same design features they put into their best backcountry packs, it sounded like they understood the needs of adventure travelers. Once I carried the pack all-day for eight days, I knew they did. The momentum’s padded foam harness, adjustable sternum and side compression straps kept the pack comfortably snug, while the built in hipbelt meant the load stayed balanced. Technology friendly. For instantly sharing photos on facebook and twitter, or e-mailing to friends and family back home, I love the convenience of my smartphone’s built-in camera. Plus, even though my out-of-office autoresponder lets people know when I’m away, I like to monitor correspondence and respond when a quick reply will be appreciated. 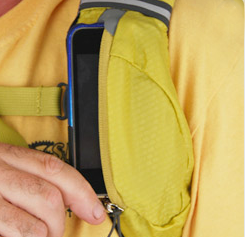 The momentum’s easy-access electronics pocket built into both shoulder straps kept my Blackberry and iPod in easy reach. 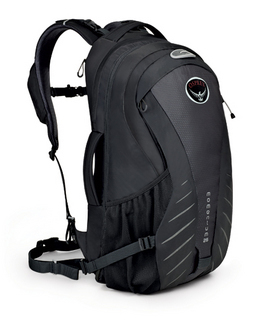 Post walking adventure, I continue to use the Momentum 26 as an everyday pack, on cycling trips and when hiking. When more room is needed, the expansion panel allows the pack to open up to 31 liters of storage capacity. U-lock pocket, hydration compatibility and a LidLockTM for quick helmet stow. All Mighty Guarantee: If you own an Osprey pack that needs to be repaired they will repair or replace for any reason, free of charge – whether it was purchased in 1974 or yesterday. Nice! Bottom line: On the fly or on the trail, this bag is built for active travelers who embrace their inner techie. Part of the Momentum Commuter Series, the Osprey Momentum 26 is available for purchase at www.OspreyPacks.com or at The Travel Store at EllenBarone.com. Suggested retail price; $129. Dimensions: 19” x 12” x 8”.